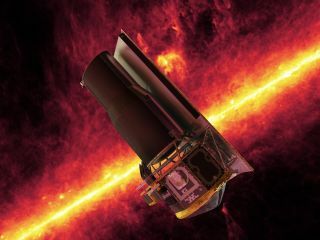 An artist's illustration of NASA's Spitzer Space Telescope. The background shows an infrared image from Spitzer of the plane of the Milky Way galaxy. The youngest member of NASA's "Great Observatory" family just turned 15. The Spitzer Space Telescope launched into orbit around the sun on Aug. 25, 2003, kicking off a long and accomplished mission that has produced groundbreaking finds in a number of different fields. "Spitzer's discoveries extend from our own planetary backyard, to planets around other stars, to the far reaches of the universe," Hertz added. "And by working in collaboration with NASA's other Great Observatories, Spitzer has helped scientists gain a more complete picture of many cosmic phenomena." Hubble launched in April 1990, CGRO reached Earth orbit in April 1991 and Chandra was lofted in July 1999. CGRO is the only Great Observatory that's not still operating; it was intentionally deorbited in June 2000 after one of its gyroscopes failed. Spitzer's prime mission was originally supposed to last 2.5 years but ended up going for more than twice that long. Things changed in July 2009, when Spitzer's supply of instrument-cooling liquid helium ran out, reducing the telescope's ability to study supercold cosmic objects. The observatory then switched to a "warm phase" of operations, in which it remains to this day. Newborn stars peek out from beneath a blanket of dust in this image of the Rho Ophiuchi dark cloud from NASA's Spitzer Space Telescope. The scope observes infrared light, which in most cases penetrates gas and dust clouds better than visible wavelengths do. The telescope has also been instrumental in the discovery of a number of alien worlds, including the seven rocky planets in the TRAPPIST-1 system, which lies a mere 39 light-years away from Earth. Scientists think that three of these seven planets might be capable of supporting life as we know it. And Spitzer's observations helped astronomers put together the first-ever weather map for an exoplanet, back in 2007. "The study of extrasolar planets was still in its infancy when Spitzer launched, but in recent years, often more than half of Spitzer's observation time is used for studies of exoplanets or searches for exoplanets," Spitzer project manager Lisa Storrie-Lombardi, of NASA's Jet Propulsion Laboratory in Pasadena, California, said in the same statement. "Spitzer is very good at characterizing exoplanets, even though it wasn't designed to do that." Spitzer is in good shape, mission team members say, and it's scheduled to keep operating through at least November 2019. Whenever the spacecraft's health begins to fail, there will be no astronaut missions to save it; unlike the Earth-orbiting Hubble, which has been repaired and upgraded on multiple occasions, the sun-circling Spitzer is millions of miles away from its home planet.